Welcome to the Blend blog! 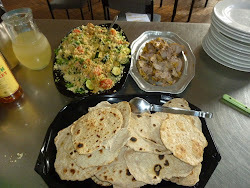 We're a small communtiy food organisation based in Sheffield, England. On our blog we'll try and keep you upto date with the stuff we're doing, share recipes and talk about anything to do with food. Please write on the blog, tell us what you think and what you eat. One of the things we’re keen to do at Blend is provide volunteering opportunities. Volunteering has so many benefits from helping people gain paid employment to ensuring services are meeting people’s needs (and changed if they aren’t). As part of our commitment to making sure our services meet the needs of our clients, we’re currently reviewing our volunteer programme. We’ve created a short online survey that if you’ve got 1 minute we’d love you to complete it. To take part in the survey and to help us get our volunteer programme right, please simply click on this link https://www.surveymonkey.co.uk/r/SMC5ZHZ . Data from the survey will be used to make sure our volunteering programme works for anyone volunteering with us and to help us secure future funding. If after you’ve completed the survey you’re interested in finding out more about volunteering with Blend, please email blendcookeatshare@gmail.com . 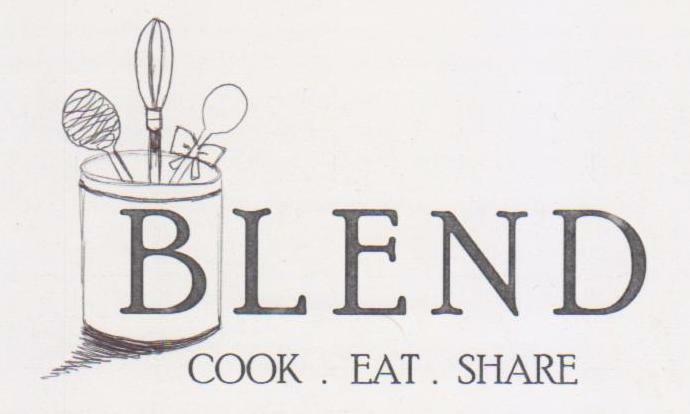 To find out more about Blend please visit our website www.blendcookeatshare.co.uk . At Blend we are always looking for alternative venues to run a pop up restaurant event or cookery class in. Venues we’ve hired previously range from old church halls in Fulwood to Walkley Community Centre on Fir Street. As long as you have a functioning kitchen space, we can hire it! We can work with you to organise a one of event utilising your space and generating income for your organisation. Are you running an event and need food? At Blend we provide a range of catering packages that can help make your event a success. Our experienced team of trained staff and volunteers can produce delicious, healthy and affordable food to attract people to your event. Ranging from a large community event to a staff away day, Blend can help make your event a success. To find out more about how Blend can work with you, please email blendcookeatshare@gmail.com to arrange a meeting or to sound us out about your idea. Blend is in an exciting time of change and development and is looking to recruit new trustees to our board. If you buy into Blend’s vision of using food to enhance the lives of the people of Sheffield and are committed to our ethos (please see about us part of our website), why not consider becoming a trustee. While unfortunately we can’t guarantee any financial gain as a trustee, you will be able to develop new skills, work with a great team of people and make a difference in the lives of the people of Sheffield. We are asking trustees to commit to attending 75% bi monthly / quarterly trustee meetings each year, undertaking any actions agreed at those meetings, organising the AGM and an annual business planning day. As a trustee you will be responsible for providing effective governance and strong strategic leadership. The ideal candidates will have experience of a similar role in either the vcf or private sector along with relevant skills and experience. If you’re interested and have the relevant skills and experience, please email blendcookeatshare@gmail.com outlining why you want to be involved and what you’ll bring to Blend. After the success of our previous supper clubs, from August we’re going to be running at least 1 each month. Each month we will be creating a unique menu, based on the first class ingredients and using classic flavour combinations. Our ambitious 5 course menus, served within some of Sheffield’s most distinctive venues, will ensure you experience a great, alternative Saturday night. For those of you who haven’t been to a Blend supper club before, our supper clubs are a great way to meet new people, enjoy a great meal or celebrate a special occasion. Our supper clubs are informal gatherings, with Blend staff providing a friendly and professional service. August provides us with some great ingredients for us to use in our menus. This month we’re going to be utilising the best fresh tomatoes, raspberries, beetroot and broad beans. We use seasonal ingredients not because it’s fashionable, we use them because they provide us with the best flavour. For the August menu, we’re going for some classic combinations like tomato and basil, beetroot and orange, lemon and raspberry and lamb, aubergine and spinach. For me, good cooking isn’t about re-inventing the wheel, rather doing the simple things well. Our next supper club is taking place on Saturday August 31st from 7.30, venue tbc (it will be somewhere with 15 minute drive of Sheffield city centre). Tomato, basil, olive tarte fine with rocket and parmesan salad. Sea bass, beetroot and orange. Assiette of Lamb with aubergine, spinach and chick peas. We had about 45 people to our Greek Cook Along night last week to make some fantastic tasting dishes. On the menu we had Spanakopita which is a delicious spinach and feta pie with a crisp filo pastry topping. 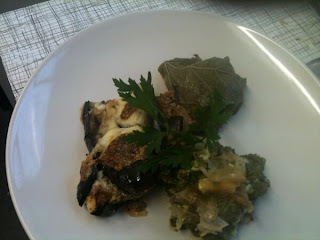 We also had dolmades or stuffed vine leaves, moussaka and a fresh and tasty Greek salad. These are the recipes that we used, they are all really simple, affordable great tasting dishes that take a little planning but are easy to prepare. I bought all of the ingredients in shops around Sharrow, you can get the vine leaves from Osmans on London Road and they come in a jar. 2 handfuls of chopped fresh herbs (parsley, mint, oregano, basil). Heat a little oil and cook the onion and garlic till they soften. Add the rice, sultana’s and pine nuts and stir through the onion and garlic. Add the water and boil to till the rice is cooked and liquid absorbed. Add the chopped herbs and leave the mixture to cool. Place 1 tbsp of the rice mixture in the middle of each vine leaf and roll into a tight parcel. Serve the dolmades either cold or heated in a steamer or microwave. Heat the oil in a pan and soften the garlic and onion. Add the mince, oregano and cinnamon and cook till the lamb is brown. Add the tomatoes and the wine if you’re using, bring to a boil and simmer for 30 to 40 minutes. Finish with some salt and pepper. Heat some more oil in a pan, slice the aubergine and soften them in the oil. To make the topping, melt the butter in a pan and add the flour. Mix them together and cook for 1 or 2 minutes. Add the milk a little at a time, stirring continuously so there are no lumps. Once all the milk is added, add the cheese and melt. Take off the heat and stir in the egg yolks. Season with salt and pepper. To assemble the moussaka, lay the softened aubergines in the bottom of a deep baking tray. Place the cooked mince on top and finish with the cheese sauce. Place the moussaka in a pre-heated oven (gas 6 / 200c) for 20 to 30 minutes or the top is golden brown. Spanakopita – Spinach and feta filo pie. Wash and cook the spinach till it has wilted (no more than 1 minute), then drain out all of the liquid. Mix the cooked spinach with the herbs, nutmeg, the cheese, the eggs and salt and pepper. Layer five sheets of the filo pastry into the bottom of deep oven dish. Brush each layer with olive oil. Next place the cheese and spinach mixture into the dish. Top with the remaining filo pastry, brushing each layer with oil. Bake for 30 minutes at gas 4 / 180c till the pie is golden brown. Serve warm. Black olives 14, cut in half. Tomatoes 3 or 4, cut into 8. Cut the cucumber in half down the middle and scoop all the seeds out. Dice into half inch size pieces. Mix the cucumber with the tomato, olives, feta, red onion, the leaves of the gem lettuce and the basil. Mix the olive oil, lemon juice, vinegar and some salt and pepper. Pour over the salad and serve straight away. Christmas part 3 - Pork pie and chocolate terrine. Now we’re only a couple of days off Christmas day, today has been an active day in the Hanson kitchen. My mine responsibilities this year are the Christmas day deserts and also a contribution to the Boxing Day get together at my mum and dads. After minutes flicking through some of my numerous cook books I opted for a delicious sounding chocolate terrine recipe from ‘Bouchon’ by the legendary chef Thomas Keller and for my mums on boxing day I opted to have a go at making my own pork pie, using a Gary Rhodes recipe from his book ‘New British Classics’. This book was the first ever cook book I bought and although the recipes aren’t that new anymore, they are all of the highest quality. For me, a well-made pork pie is one of the finest things to eat and will be ideal for Boxing Day. I did tweak the recipe slightly from Gary Rhodes, using slightly different seasonings to flavour the pie and make it unique to me, however the quantity of meat and the pastry recipe used the recipe from the book. I also decided against including a traditional jelly on my wife’s request. 1kg of pork, chopped into ½ cm pieces – my preference is for pork shoulder. If my family were slightly more adventurous I would have included 200g of diced black pudding or chorizo and just used 800g of pork. 200g smoked streaky bacon – the saltiness and fat content in the bacon will help ensure a moist pie. Rosemary – a few sprigs, finely chopped. You could use thyme and sage if you wanted too. 1. Start by melting the butter in a pan, add the onion and soften without colouring for 5 minutes. Add the rosemary and a generous pinch of salt and pepper. 2. Mix the onion with the pork, followed by the remaining ingredients. But the filling in the fridge while you make the pastry. 3. At this point turn your oven onto gas 7 / 220c and grease a deep pie or cake tin with either butter or lard. Pork pies are traditionally made with a hot water pastry, which I love. This is how you make it. 1. Boil the water, milk and lard in a pan. 2. Put your flour and salt in a large mixing bowl and stir in the liquid till you have a smooth dough. 3. Roll out ¾ of the dough for the base of the pie and place the pastry into your tin. 4. Once the pastry is lining the tin, place your pork mixture in and press down well. 5. Roll out the remaining pastry for your pie lid, stick to the bottom with the beaten egg. Crimp round the side, cut a hole in the top and brush with more beaten egg. 6. Cook the pie for 30 minutes at gas 7 / 220c before turning the oven down to gas 5 / 190c for another hour. 7. The pie is cooked when the pastry is golden brown and a skewer comes out of the pie clean and is hot when you put it on your lip. 8. Leave the pie to cool and give it a couple of days in the fridge to mature before eating. I like my pork pie with either brown sauce or a nice chutney. A lot of my family like there chocolate, so I thought I’d do something chocolaty for Christmas day instead of the traditional pudding. I’ve decided that I’m going to use the classic chocolate and cherry combo and serve the chocolate terrine with some stewed cherries. 4 eggs separated + 4 additional egg yolks. 1. Melt the chocolate and butter in a bowl set above a pan of simmering water. When melted and cooled slightly, stir in the egg yolks. 2. Whisk the cream till it stands up when you take the whisk out. 3. Whisk the egg whites, when stiff whisk in the granulated sugar. 4. Mix the caster sugar and the cocoa powder into the chocolate mixture. Next fold in the egg whites and then fold in the whipped cream. 5. Pour the chocolate mixture into a loaf tin lined with cling film and put into the fridge to set for a minimum of 12 hours. 6. Heat some frozen cherries with some caster sugar till they are nice and syrupy and leave to cool before serving with slices of the terrine. For most, the Christmas dinner menu is based around a giant piece of meat large enough to sink the titanic. However, I feel the need to spend some time writing on behalf of vegetarians as they so often miss out ending up with some crap after thought from the host. For me, December is still an exciting time when it comes to interesting, seasonal vegetables that can be used for either a main course or to accompany the traditional roast. I’m going to give you a couple of simple, tasty vegetarian alternatives we’ve cooked at some Blend events this year that fit the bill. The first one is a great burger, made with mushroom, spinach, walnut and some cheese. These burgers are really tasty and will put a smile on the face of most vegetarians. You can make them the day before and take no more than 15 minutes to prep and cook. Ingredients – 200g mixed mushrooms, handful of spinach, clove of garlic, 2 sage leaves (chopped), 1 sprig of rosemary, handful of walnuts, 1 cup of polenta, 1 cup vegetable stock and about 100g of parmesan cheese. Method –Fry the mushrooms, herbs and garlic in a little oil till they soften. Chop the nuts and add along with the spinach. Cook till the spinach is wilted, season generously with salt and pepper and leave to cool. Make the polenta by boiling 1 cup of vegetable stock, adding the polenta and mixing well till you have a smooth paste. Cook the polenta for 5 minutes over a low heat, grating in the parmesan and adding salt, pepper and an optional knob of butter. Mix the cooked mushroom mix and polenta together, taste and season really well again and leave to cool for 10 minutes. Shape the cooled polenta mixture into burgers, pan fry for 3 minutes on each side or till they are golden brown and heated all the way through. I like to serve them with a nice tomato sauce with some chilli through it. Tarte tatin doesn’t always need to be a dessert. This dish is another one you can prepare ahead of time and is something a bit different for the vegetarians in our lives. The finished dish is pretty stunning when you turn it out too. Ingredients – puff pastry, sugar, vinegar (balsamic or red wine are good options here), cooked beetroot, beaten egg, knob of butter. Method – roll out the pastry to the size of a frying pan and put to one side. Heat the sugar with a splash of water in a pan till you have a light caramel, then add a good splash of the vinegar and the butter. Make sure you don’t stir the caramel or it will go grainy. Arrange the beetroot in the caramel and place the pastry over the top. Brush the pastry with beaten egg and bake in the oven at gas 6 / 190c for about 20 mins till the pastry is cooked through. Flip the tart out and you can crumble some nice cheese over at this stage if you want too. Please think about vegetarians this Christmas, we carnivores often disregard them serving them some pretty awful food.